Wacky clown feet with crazy striped socks and oversized purple suede shoes! Isolated. 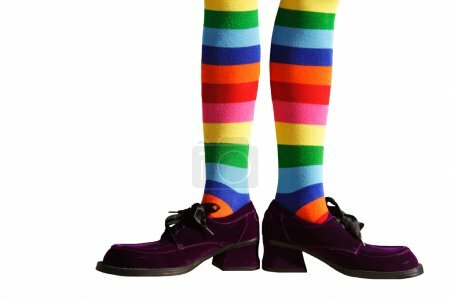 green, fun, red, yellow, large, white, blue, striped, background, on, isolated, birthday, party, feet, orange, funny, big, purple, stocking, legs, with, stripe, long, foot, leg, shoe, crazy, stockings, halloween, shoes, costume, Costumes, sock, and, suede, socks, chunky, clown, Oversized, wacky, clowns, knee-his, knee-hi, isolated.